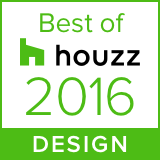 Many home remodeling projects, whether it's a kitchen or home addition, will include an exterior deck. Exotic hardwood decking is a popular choice for those looking for a beautiful, long-lasting deck. Because there is a perception that all exotic hardwood is expensive, some people tend to shy away from the product, but when considering the durability, low-maintenance and desirability of the product, exotic hardwood decking can be a smart choice, and depending on the type of wood you choose, less cost than you think. Ipe tends to have a cool, grey color as it ages. Ipe is the most popular choice for exterior decking for its durability and its ability to look good for many years. Also known as Brazilian walnut, it has a rich deep brown to olive brown color when oiled. Because of the high demand for this beautiful wood, the price has become more expensive in recent years. Cumaru has a more reddish tone than ipe, but still offers durability and aging gracefully. Also known as Brazilian teak, this exotic hardwood is more moderate in cost, making it a great alternatie to ipe. Tigerwood, just like it sounds, has a reddish-orange color with black streaks. Tigerwood is not as dense as some of the other exotic hardwoods, but it will last 25 years or more, providing homeowners with a truly beautiful and unique look. Garapa is a golden-brown wood that takes on silvery gray tones as it ages. It is resistent to rot, decay and scratches without the need of any sealant or oils. Sometimes known as Brazilian ash, it is a more affordable alternative to teak and ipe. Massaranduba is a Braziliaan redwood, known to be some of the toughest and most durable types of wood in the world. Because of its reddish tones, it is often compared to mahogany. Teak (pictured at top) is one of the most beloved, and most expensive, decking options available today. The natural oils give this wood its own defense mechanism, eliminating the need for sealants. While it is a pricier option, it is one of the highest quality and longest-lasting woods for exterior use. Exotic hardwood decking is not only beautiful, but low-maintenance and durable. These woods have been popular for many years for use in ship building and luxury yacht decking. Whether you have a home with children and dogs, or are constantly hosting friends on the deck, you will benefit from the density and durability of exotic hardwood decking. 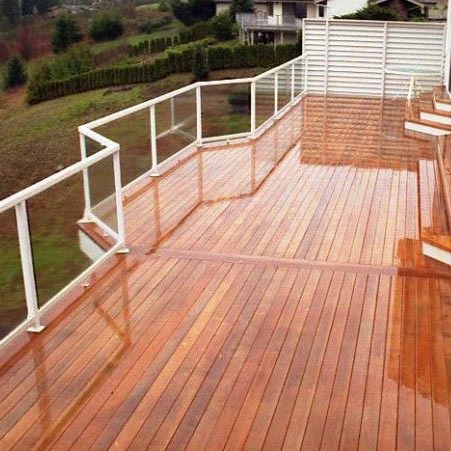 There is no need for oiling or sealing the deck, because the wood naturally resists decay and damage. A soft patina develops over the years and can be restored to its original beauty, if preferred, through sanding. To keep the deck clean, simple soap, water and a scrub brush will do the trick. Pressure washing is not advised. These types of woods are extremely heavy, so hiring a professional team to do the installation will help save your back and ensure proper installation. Because of the density of the wood, special tools are often needed to cut and assemble, such as carbide saws and drills. Sustainability is also a concern for some homeowners, who want to know the wood is harvested responsibly. Woods like ipe are harvested responsibly through the Brazilian authorities, and there is also an organization called the Forest Stewardship Council which certifies wood based on the sustainable harvest practices. This certification will cost significantly more, but is also LEED eligible. Degnan Design-Build-Remodel can provide you with more details about the types of wood available as well as their many benefits. We can also talk to you about how these exotic hardwoods can fit into any exterior design, from a home addition to an exterior deck. A domestic wood harvested in North America, Western Red Cedar has a warm tone when new. If left to age untreated, it will weather to a grey color. Routine staining can make this naturally rot-resistant wood last for decades. Western Red Cedar decking is arguably the preferred species of domestic wood decking, other than ordinary treated pine decking. Although not a hardwood like the exotics discussed above, cedar is naturally rot resistant and with proper maintenance can last for two decades or more. In general, forestry harvest practices in the United States are considered to be more sustainable than exotics imported from other countries. As a matter of green building practice, it is preferred to source lumber from within 500 miles, if possible, and certainly from within the same continent. If these issues are important to you, then you might consider using cedar decking. All photos in this blog are courtesy of Weeks Forest Products. This article was updated by Abe Degnan on 7/27/2018.